Home » Uncategorized » Wahoo! 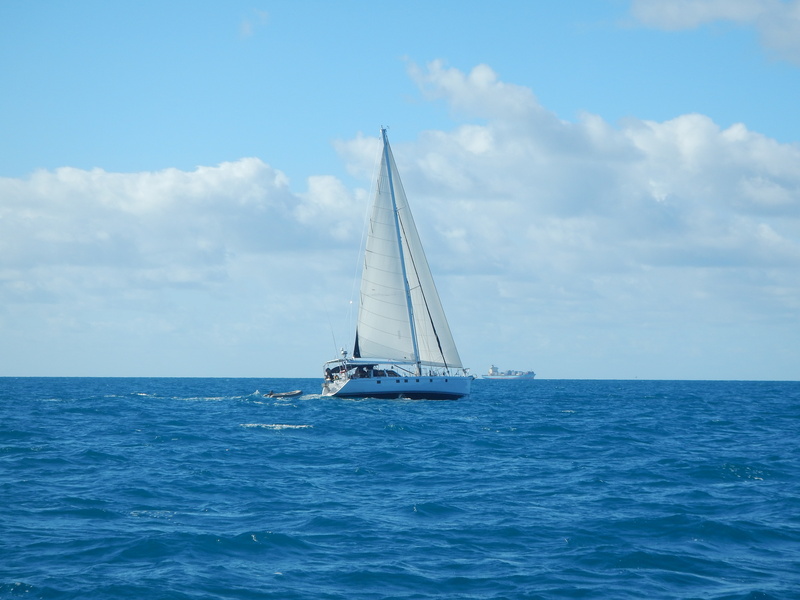 The wind had started building gradually from the East, replacing the glassy calm with small spreading patches of ripples as we motor-sailed across the calm ocean. Bruce: “It looks like something is dragging on the fishing line, must have snagged some weed or something”. Lyn: “Maybe it’s a fish!” Bruce: “Maybe, doesn’t look like it though.” The fish was dragging fast behind, mouth wide open, not skipping along the water like I’ve seen before.We excitedly pulled it in on the hand-line, no fight, it must be dead already. As it gets close to the boat it starts to fight with what it has left, my hands are getting cut by the tracer wire. “Get a towel or something!” We manage to get it onto the sugar scoop – it’s big! Lyn jumps down with a knife and cuts it’s throat, it’s still struggling a bit, pours whisky in the gills, still struggling. Eventually with the head almost cut off it hangs still from the pushpit by its tail. It’s a huge wahoo, our first fish! Last Tuesday at Abel Marina, Airlie Beach Cattsy (Paul Catts) arranged to meet us at Sorrentos bar for drinks after work. As chance would have it I bumped into Craig Parsons (Ocean Star) on the way to the showers. He had just arrived back after flying down to the Central Coast for his daughter’s engagement party. We ended up having almost a re-union of the drinks and pizza of a few weeks earlier with Cattsy, Emma and Craig, except this time at Sorrentos and with the delightful addition of my Mom Joliette. On Wednesday we headed out in the direction of Happy Bay. With the wind still blowing strong from the South East we kept the sails down and motored with Lyn driving and me working down below, a truly mobile office! We stopped at Bauer Bay on South Molle Island for lunch on the boat, picking up one of the resort moorings. The resort is closed and Lyn and Joliette took Silus ashore to have a look, but were chased off by one of the staff. We continued on to Happy Bay, where the Long Island Resort has a much more welcoming policy. After work it was to the shore for some very expensive but delicious cocktails. Mom and I had the Toblerone, which is a bit like an alcoholic chocolate milkshake – delicious, whilst Lyn went for her own customized version of the Capriosca. The next day was largely uneventful, with me doing my software work and the girls and Silus relaxing on the boat. Late in the day Anthem arrived, just in time for sun-downers at the beach bar. We had a hilarious evening of cocktails and dinner at the beach bar. Farm boy Adrian couldn’t resist catching one of the scavenging Curlew birds, with Lyn to the rescue releasing it. There was a brief moment of concern as one of the resort staff had some stern words for the cowboy, but all was soon forgotten and more cocktails consumed. Friday was the last day of my two week remote work stint. No more need to stay in internet zones – yay! We arranged to meet Anthem out at Chalkies Beach as we wanted to show Joliette this lovey place before she had to fly out on the Saturday. We motored against the South-Easterly in the afternoon, with me completing my work with the last of the internet before we turned into Solway Passage. Anthem were invited to dinner, delicious chicken on the barbie washed down with Adrian’s fine wine. As chance would have it Joliette, Julie and Phil were all on the same flight out of Hammo so the two boats headed off for Hammo in the morning. We moored the boats on the Hamilton Island moorings in Dent passage and took the travelers across to the marina in the dinghies. It was sad saying goodbye to my Mom, we always so enjoy her company but we will see her again soon back in Sydney. Setting off back to the boats Adrian took a sharp left turn out of the Marina and up to the airport runway. When we saw him standing up in his boat waving both arms we thought: what a sweet guy he is, waving goodbye to his friends so enthusiastically! We thought nothing more of it as we let go of the mooring and started motoring off. Then we saw someone in the distance rowing his dinghy furiously across the tide and being swept way down-stream of the moorings. It was Adrian. He had run out of fuel and his waving had been for us to rescue him. We felt terrible that we had not realized as we gave him a tow back to Anthem. Now the race was on! Anthem versus JoliFou versus time itself. It was 1pm when we left Hammo and the destination was Bait Reef. The wind was a good moderate South Easterly and the tide was ebbing Northwards in our favour, but it was going to be touch and go to do the 35 miles and get to the reef before sunset. We sailed Northwards inside the islands before turning out through Hook Passage for the crossing to the reef. There was some discussion at this point about the advisability of continuing or rather overnighting at Butterfly Bay. The thing is, the wind was really good and was going North East tomorrow so it would mean a long motor against wind and tide in the morning. On the other hand, continuing on would mean arriving at Bait Reef at sunset. Although we are now quite familiar with the place (this would be our 4th time there), we had never before anchored there and we had to be prepared for the likely scenario that all moorings would be occupied. After some thought and discussions with the Cowboy (Adrian, he voted yes of course) we went for the “fortune favours the brave” approach. We arrived as the sun was setting. Adrian went to investigate Manta Ray mooring as an option but it was way too exposed and bumpy. There was one private mooring available inside the stepping stones, which we knew had no mooring line on it, so would require us to thread our own. We decided to have a go at it, but after a highly stressful time trying to snag it and breaking the boat hook in the process whilst dodging bommies either side in quite fresh wind, we decided that anchoring was the better option. It was now getting quite dark. We followed Adrian to a spot on the chart, north of the stepping stones, where we had seen boats anchored before. 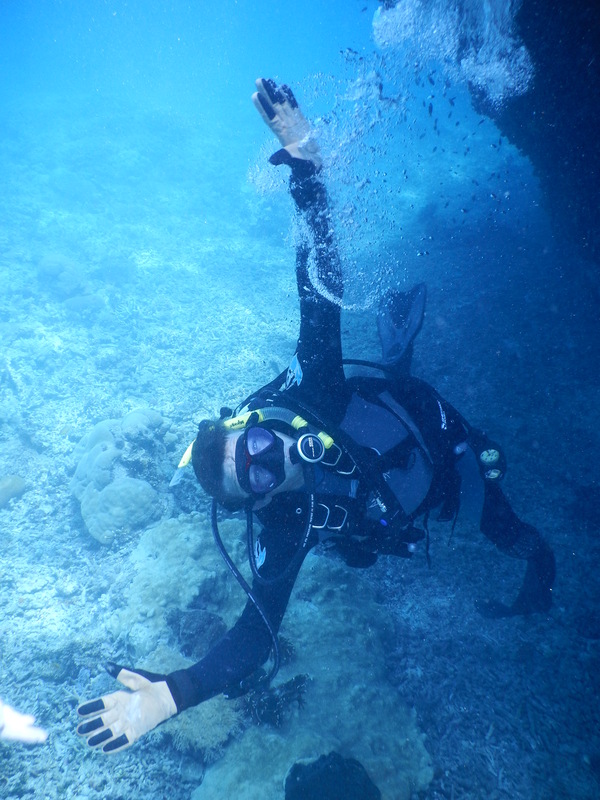 The bottom was 15 meters deep with a mix of coral and sand, but the anchor held to our relief and we were settled, albeit ending up much too close to Anthem as we both tried to get set as soon as possible. Oh well, we are all good friends. Adrian was kind enough to pick us up in his dinghy to save us launching ours and we went across for steaks for dinner on Anthem (and fine red wine of course). It was a restless night with us getting much too close to Anthem in the wind and strong tidal flow. In the middle of the night I let out more chain which improved the situation and we got some sleep. Next morning it was beautiful, with the wind dropping away. A boat left a mooring at the stones and we decided to take Anthem over there with all of us and our dive gear and leave JoliFou by herself on anchor (by now we were very confident of the anchor holding). We left Silus down below on Anthem and took our dinghy with dive gear up-tide and over to Anaconda III who agreed that we could tie it on their mooring. We had a very pleasant dive on the stepping stones, drifting down-tide and somehow managing to land up exactly under Anthem. To our great surprise a madly barking Silus had managed to find a way out onto deck although we had had him in the pilothouse with closed door. Time for some different reef exploration, we set off for Fairey Reef 15 miles to the North West, motoring in the light breeze. This time we arrived in good time at about 3PM, which was just as well because we were the only boats there, did not know the place and took a while to figure out that the Navionics chart position of the lagoon entrance was wrong by at least 100 meters. We are starting to realize that although the electronic charts are superbly accurate in the oft frequented areas, in the remote places they definitely cannot be trusted. With Lyn standing on the pulpit at the bow, me steering and Adrian following close in our wake on Anthem, all with hand-held radios we picked our way in through the bommies of the entrance area and anchored in a sandy area. Absolutely gorgeous clear blue water! After filling the tanks on Anthem Adrian and I set off for a dive whilst Lyn opted to relax with Silus on Anthem. We started at a nearby bommie but the fish life was un-inspiring so we took the dinghy all the way out to the outside of the reef entrance. Here it was much more interesting with many large fishes including a few huge Maori Wrasse. It was approaching dusk, feeding time and the fish were frisky, including three or four reef sharks who were being quite aggressive in their approach to us. Whilst I was occupied with something Adrian disappeared up a gulley and I couldn’t find him. It was starting to get quite dark under water now and I elected to head back to the dinghy. I had a few worried moments sitting in the dinghy and concerned for Adrian as it got progressively darker. Lyn had the same concerns as for the second time recently she saw only one person in the dinghy and didn’t know if it was Adrian or I. 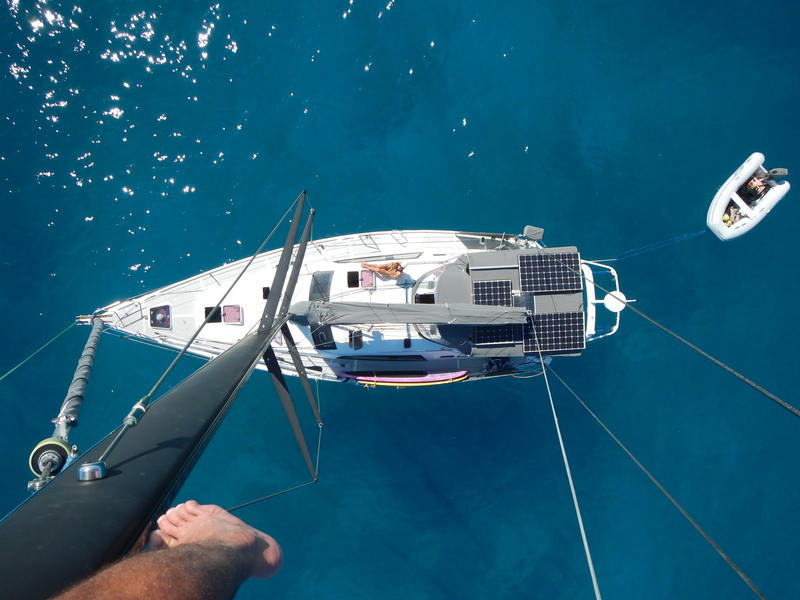 She started heading over in the JoliFou dinghy, but Adrian soon popped up and all was good. We stayed on Anthem for barbecue fish that Adrian had caught earlier (some kind of sweetlip). Then it was time for bed, exhausted we slept really well in the quiet anchorage and light winds. Next morning dawned with perfect still glassy conditions. Two boats alone, seemingly in the middle of the ocean in perfect clear sparkling water. Lyn and I took turns going to the top of the mast to take photos and enjoy the view of the surrounding reef, then a swim and breakfast before our next dive. We took the dinghy out to the same area we had been at the previous afternoon, south side of the entrance. We started in a gorge just inside and worked our way out and around to the outside wall. The visibility was stunning and it was an amazing dive – best ever on the trip with much fish life including a huge Queensland Grouper and a large turtle. 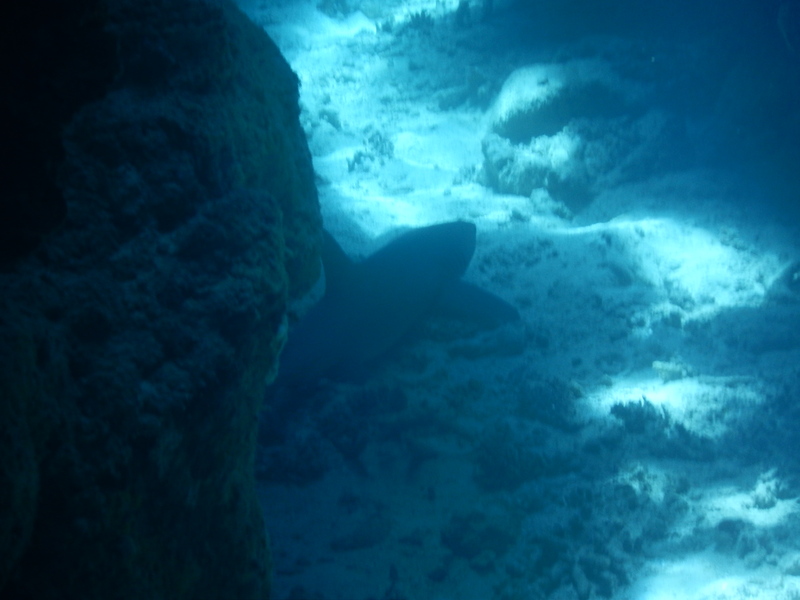 At one point we saw a large black tip shark, I followed it and it swam into a cave-like narrowing gully. The others came over and we swam carefully into the cave. The shark was lying on the ground facing away from us, Lyn snapping photos madly. 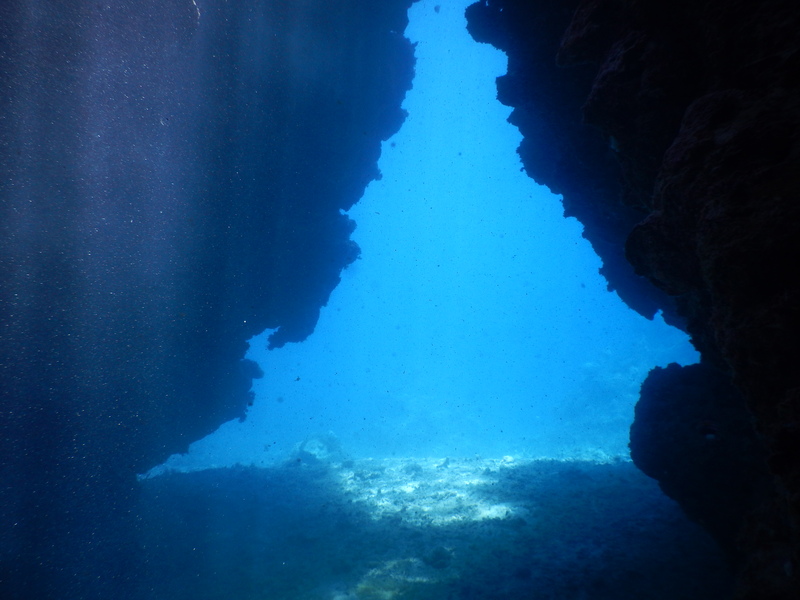 Then Adrian started further into the cave and the shark swam upwards up the gully with Adrian and I following. It then started to get that trapped feeling and turned around, heading straight back at us! Adrian and I hugged the ceiling, trying to get out of the way as much as possible as the shark swam beneath us. Lyn had not seen it turn and was right in its way, getting a huge fright as the shark suddenly appeared underneath me. The shark was probably the most frightened of us all and turned again up and out the top of the gully/cave into the shallow reef and away. 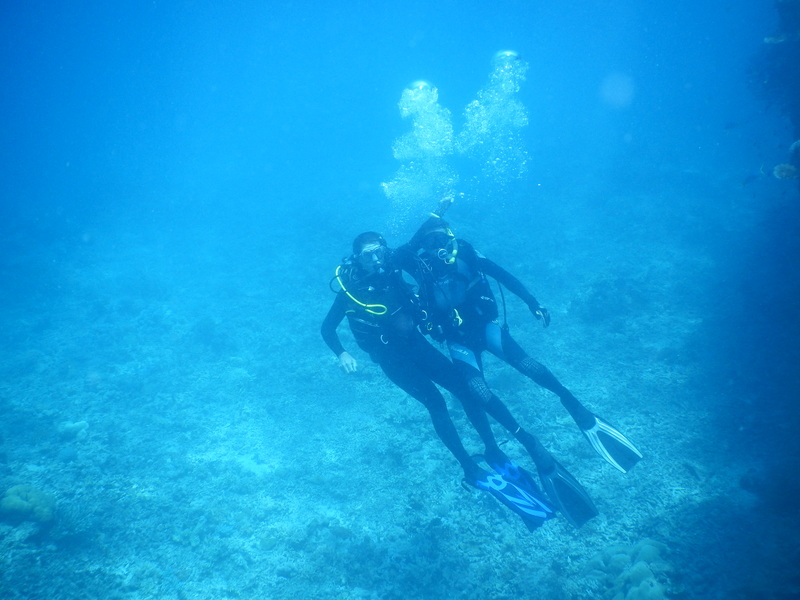 We were all really elated after the dive as we cruised slowly across the clear water back towards the boats. We passed over what must be the Henries Bommie dive site as we saw a huge giant clam in a gully in the middle of it. Unfortunately the time had come for the JoliFou to start heading south and now was the right time with the wind forecast to blow from the north for the next few days. We bid a fond farewell to Fairey Reef, following our track on the plotter back out of the lagoon with Lyn reef spotting up front. Sadly we were also parting company with Adrian and Anthem for at least a while, as he was staying in the island for a few more days awaiting delivery crew arrival. We hope to catch up with him in Newcastle later if he doesn’t manage to overtake us on the way. Motoring in glassy flat conditions outside Fairey Reef there were swarms of birds with plenty of fish activity. Anthem and JoliFou were weaving along trying to hook something on our trolling lines, but with no luck. 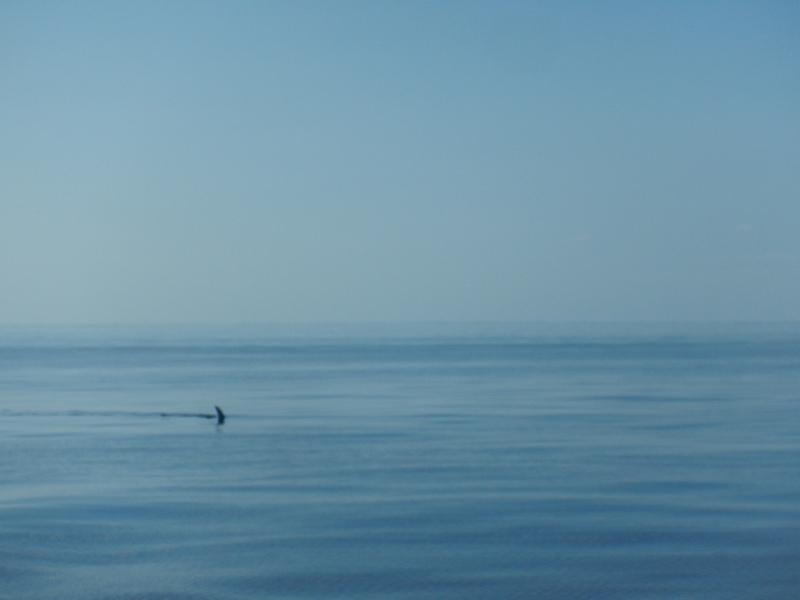 Later we saw a large fin cutting through the water and altered course towards it, with Lyn on the bow identifying it as a huge hammerhead shark, shortly followed by another. The wind filled in gradually and the sails went up and we had lost interest in the fishing line out the back when we hooked the fish. The enormity of this catch must be seen in context of the fact that Lyn has been trying to catch a fish for a very long time. Neither of us have ever done much fishing and the plan was that this would be Lyn’s thing. It started months ago in the Pittwater with Lyn getting much advice, loaned gear etc. from our keen fisherman friends there (thanks Dal, Jonty). Despite many hours with a line over the side the efforts only yielded a couple of tiny snapper which were released. Then on this trip we have been trolling a line for much of the time, heeding valuable advice from James and Leah and Craig Parsons (who seems to catch more than his fair share). But nothing, nada, couple of nibbles, one straightened hook, no fish. We were beginning to lose hope, so this huge wahoo is a significant milestone indeed in our journey towards being proper cruising sailors. By jolifou in Uncategorized on November 2, 2014 . WOW, WOW and WOW again……….Such excitement and Lyn, that fish was H U G E!!!! I think you are an amazing person to firstly catch such a large fish, and secondly to be able to slit it’s throat, even before the whisky!!!! Pity the fish did not realise that it could have had a lot more whisky if it had just been good and not struggled so much……and let you pour the precious alcohol down its gills!!! You must have both been very excited and had many free meals, which would have been prepared by you – the gourmet chef!!! More exciting and dangerous tales under the sea – makes me shudder when I think of those sharks coming towards you…………what a ‘whale of a time’ you have both had – having that cowboy with you certainly added to the excitement and daredevil moves by you two boys!!!!!! Poor Lyn with two risk taking cowboys to have to deal with!!!!. Wonderful suggestion of yours that Keith and Merle join you for a sail on the way back. They were both very excited and had tickets booked to Maloolabar before you could say Jack Robinson….good to hear all your happy voices a few minutes ago………Enjoy the rest of your journey and make sure your extra crew do lots of duties on the JoliFou!!!! Lots of love and see you all soon. p.s. How did Silus manage to escape onto the deck of Adrian’s boat!!!!!????? Maybe he will learn to climb your stairs soon, so you had better watch your 2nd mate very closely! Loved all the photos Lyn…………they are amazing especially the ones underwater and from the top of the mast!! !